I’m back with Gimmick or Good? at CBR’s Comics Should Be Good blog. This week, I’m spotlighting Amazing Spider-Man #358, the final chapter in the six-part “Sidekick’s Revenge” arc, which had guest stars galore, such as Punisher, Moon Knight, Nova, Darkhawk and more! 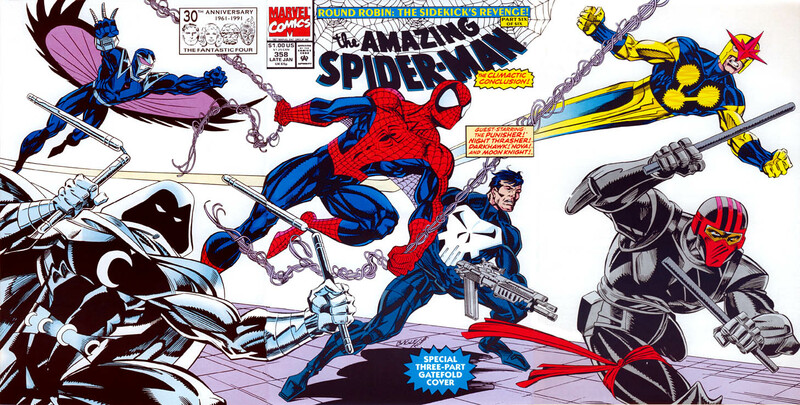 Continuing with the April theme, ASM #358 also features a gatefold cover courtesy of Mark Bagley, revealing the entire cast of characters. Click here for the complete Gimmick or Good? archives. Funny enough, I remember that I did a book report on Sidekick’s Revenge back in Elementary School. I’m sure it was a terrible project, but I probably had the best diorama of the bunch. I totally did a book report on this collection of Spider-Man based short stories (in book form) when I was in 7th grade, but since I centered the whole thing about “power and responsibility” and compared it to Orwell’s Animal Farm, I got a good grade on it. See, even then I was always reaching to try and make Spidey about higher learning and literature!! !